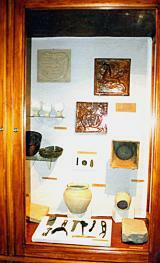 On the first display we can see ceramics from the middle period of the Bronze Age. They belong to the vatyai culture and were found in his local excavation. The Romans occupied Transdanubia in 11-10 B.C., and this area was annexed to the Roman Empire as Pannonia. A settlement developed near Aquincum - Solymár is situated here now- where there lived Celtic, Eravisc and Roman inhabitants together. On his second display we can find dish parts, restored items found during the excavation in he Roman cemetery.